Jesus looked around and saw [John the Baptizer's two disciples] following. "What do you want?" he asked them. They replied, "Rabbi" (which means "Teacher"), "where are you staying?" "Come and see," he said. It was about four o'clock in the afternoon when they went with him to the place where he was staying, and they remained with him the rest of the day. 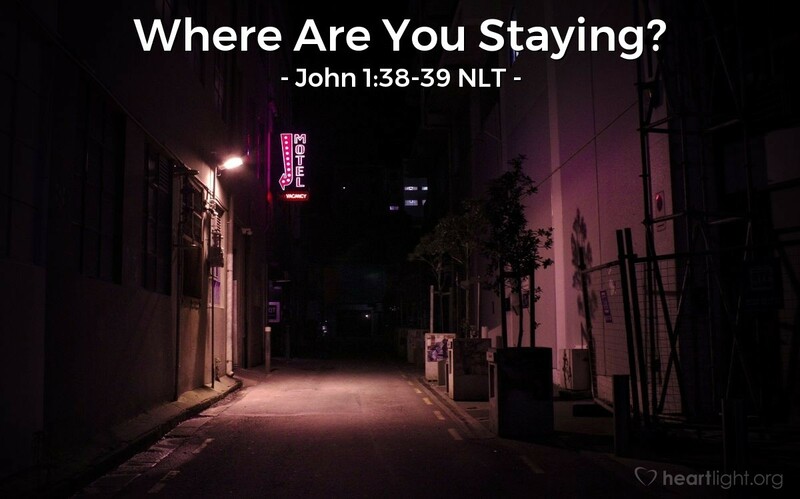 "Where are you staying" could be accurately translated by the slang expression, "Where're you at, man?" The disciples wanted to know where Jesus' heart was. They wanted to know "what made him tick." They weren't looking for his room decor or the layout of his floor plan; they wanted to know if they should give up everything they had and follow him. Jesus' invitation to these early disciples is also an invitation to us. "Come and see," Jesus says. "You want to know my heart? You want to know what is important to me? You want to know how I can bless you? Come and see!" Jesus invites us to meet him through the Gospel of John. If you are not sure about Jesus, don't just read books about him; come, read his own story in the Gospels, especially the Gospel of John. He asks us to come, stay with him, and learn from him. He invites us to come and see! Father, I do want to know Jesus. I want to know his love for me. I want to know his deity and glory. I want to know why he did what he did and why he cares so much for me. Please reveal Jesus to me as I seek to know him in this journey through the Gospel of John. In Jesus' name, I pray. Amen.